Are you a lover of art and fashion? Then you need to attend this amazing event coming up on Friday! 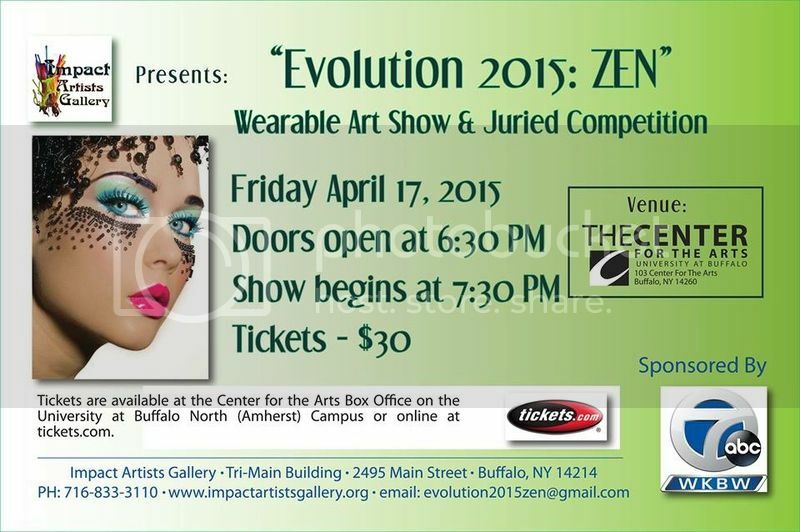 It's the Evolution 2015: Zen Wearable Art Show and it's going to be amazing! I've talked about wearable art shows in the past on my blog (HERE and HERE), and they are always such incredible events to attend. The designers are SO talented and creative to make pieces which are truly the definition of "wearable art." If you've attended these events in the past, you aren't going to want to miss this one. I think it's going to blow all of the past shows out of the water! I'm going to be modeling an amazing piece by Brook D'Angelo. You are going to die when you see what the dress is made out of! Tickets for this show are $30 and can be purchased at the UB Center for the Arts Box Office or online at tickets.com. Hope to see you there!